Justin Welby, the new Archbishop of Canterbury, was educated at Eton and Trinity College Cambridge (no, not Trinity Hall but our younger rival next door!). His enthronement will take place in Canterbury Cathedral next week, on 21 March and will be televised by the BBC. One item due to play a key role in the ceremony is the St Augustine’s Gospels (Corpus Christi College MS286). This magnificent manuscript is a vulgate text of the Gospels of Matthew, Mark, Luke and John and was probably brought to England by St Augustine in 597. The practice of using St Augustine’s Gospels for the enthronement of the Archbishops of Canterbury was revived in 1945. The Parker Librarian, Christopher de Hamel, will remain in charge of this precious manuscript throughout the ceremony. 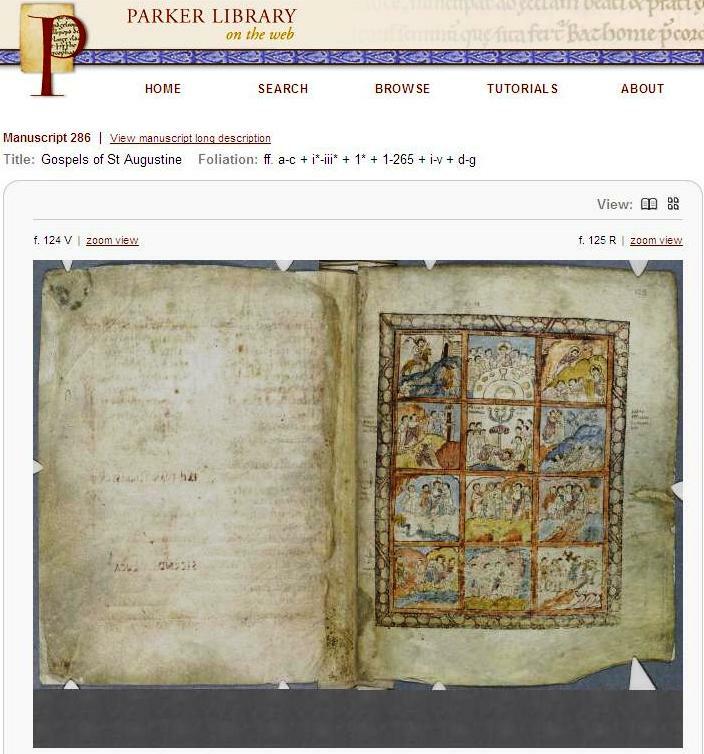 But why is a Corpus manuscript featuring in our Old Library blog and what its connection to Trinity Hall? The answer lies in one of our own most precious manuscripts Thomas Elmham Historiae Abbatiae S. Augustini (Trinity Hall, Cambridge, MS1) created in about 1410-1413. On one leaf of Thomas of Elmham’s history is a remarkable early plan of the East end of St Augustine’s Abbey. It is finely drawn in red, blue and black and features the chapels of the East end, various reliquaries, the high altar and the altar screen. “At the top of the screen are six books identified by a small inscription as the books sent from Pope Gregory (the Great) to Augustine”. The entry in the Cambridge Illuminations exhibition catalogue continues, “It is intrinsically probable that they included the St Augustine’s Gospels.” Thus our manuscript contains the earliest depiction of the Gospels used for the enthronement of the new Archbishop! 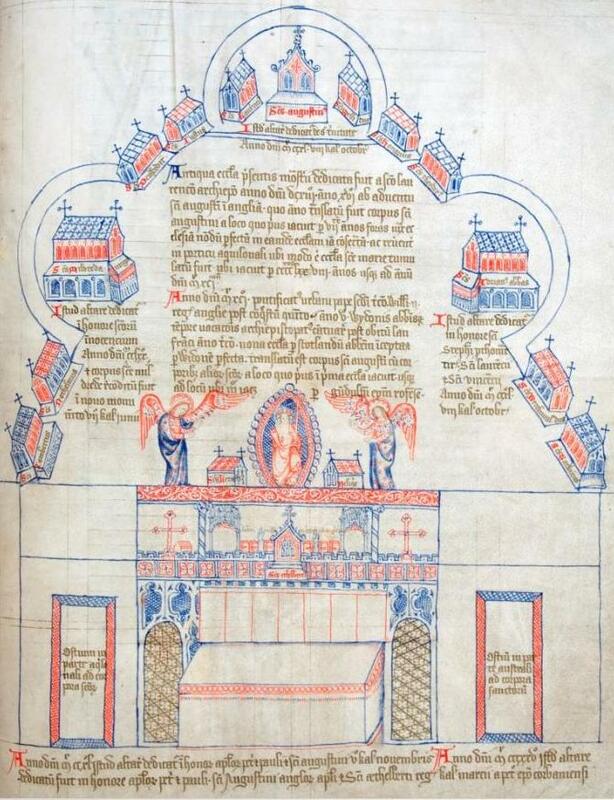 As one of the holiest works in Britain it is more than likely that St Augustine’s Gospels were kept as an object of veneration with other sacred texts above the high altar of the Abbey. The Abbey was destroyed during the dissolution of the monasteries and remains a ruin today. 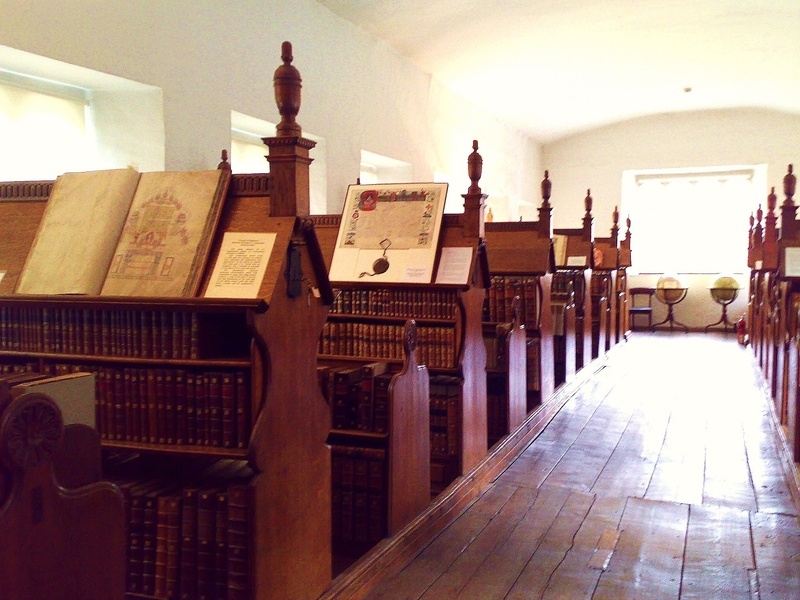 The monastic library was dispersed and its manuscripts came onto the open market. Our manuscript was collected by the antiquarian and Catholic sympathizer, Robert Hare (d. 1611), who was a great donor not only to Trinity Hall but also to the University Library. 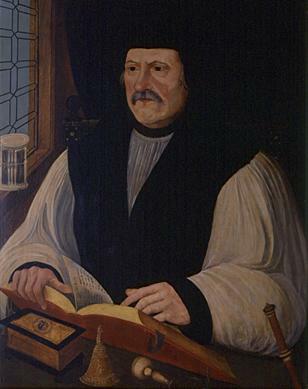 Thomas Elmham’s Historiae Abbatiae S. Augustini came to us as a result of Hare’s friendship with Henry Harvey (Master of Trinity Hall 1559-1585) and has been a treasured by the College ever since. The St Augustine’s Gospels can be seen at the Parker Library on Maundy Thursday, 28 March, from 2-4pm (for further information see Easter at King’s on the Parker Library blog). 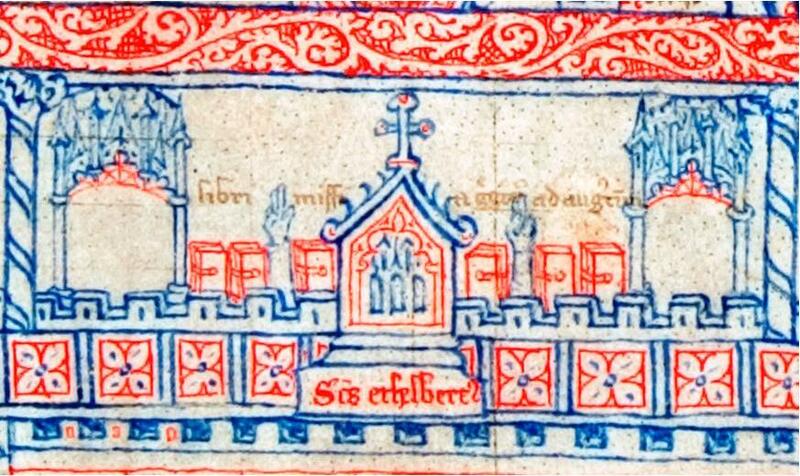 Thomas of Elmham’s History of St Augustine’s Abbey can be seen in September during bookable tours of Trinity Hall’s Old Library organised by Open Cambridge 2013 and the Alumni Weekend. Last week I had the total pleasure of spending four days in the gorgeous surroundings of the Parker Library at Corpus Christi College, and in the company of its unremittingly and uncommonly awesome staff, Gill and Suzanne, the sub-librarians, and the protean Shiralee. Having never been to the Parker Library before, and being only a rare books ‘shambrarian‘ myself (as the cool kids would say, so I’m told), this was SUCH a treat. Probably akin to Italian chocolates. Which, incidentally, the Parker Library staff also have. Getting down to business, the library is actually nothing to do with Spiderman, but is named after Matthew Parker (1504-1570), one time Archbishop of Canterbury under Elizabeth I, and even more prestigiously, former Master of Corpus. 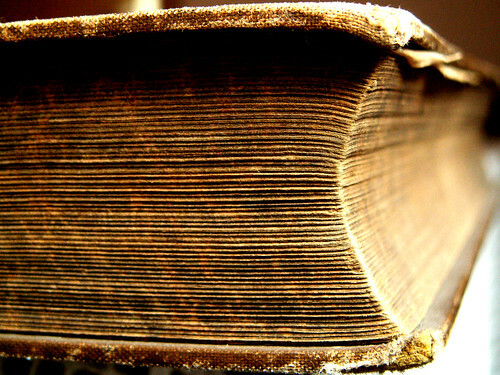 Among other things, Parker was a prolific collector of ancient manuscripts and fortunately, a generous one. He was a great benefactor of Corpus, as well as Gonville and Caius and our fair Trinity Hall. His munificent benefaction to Corpus included his books and manuscripts, and it’s an incredibly fine collection. Parker also seemed to understand its value–so his benefaction reveals a sense of his fondness for the college. And he also understood how precious this collection was, which led him to draw up some practical and, dare I say, stringent conditions for their protection. An annual inspection was to be conducted, led alternately by the Librarian at Caius and at Trinity Hall, and should twelve (12) items be missing, the entire collection would pass to the ownership of Caius with immediate effect. Should any carelessness emerge at Caius, then Trinity Hall would become the lucky recipient of this astonishing gift. It’s quite a relief then, for all concerned I’m sure, that the clause was never evoked. Parker’s stipulations are now merely ceremonial, and a good excuse for a big posh dinner. That’s my kind of library rule. The collection at the Parker is nothing short of extraordinary. Really. I mean it. In normal circumstances I’d be telling you to go and see for yourself, but I don’t need to–because it’s all ONLINE. 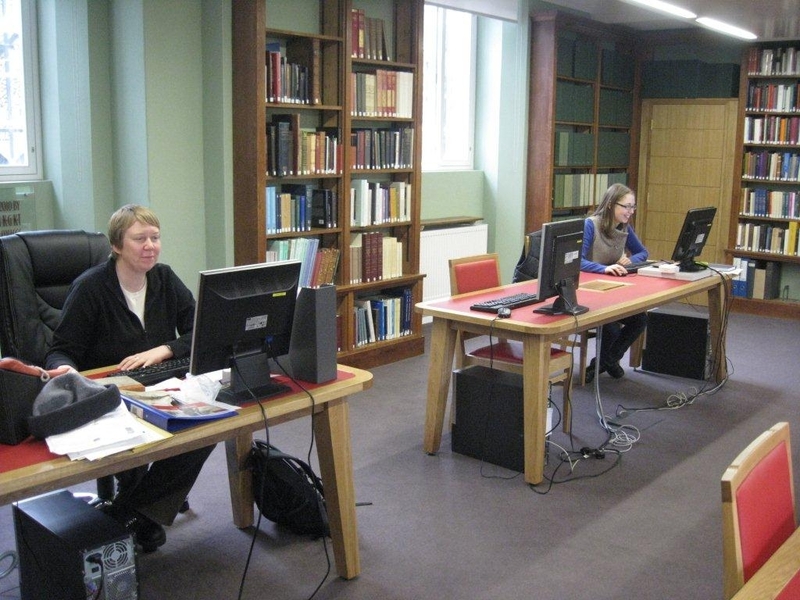 You can, from the comfort of your ergonomic desk chair, or comfy armchair, go to the Parker Library on the Web site. This is the result of a digitisation project based at the Parker which took place from 2005 to 2009. The aim of the project was to produce a high-resolution copy of almost every page of almost every manuscript in the Parker Library. The result, the website, it astonishingly comprehensive, the images are of a brilliant quality, there’s lots of detail about each item, bibliographies, foliation detail, all sorts. Just go and have a look (once you’ve finished reading my blog post, of course). You can even look with a cup of tea in one hand and a chocolate biccie in the other (mind your computer though). It’s quite simply a fabulous resource and the result of some really serious teamwork. One of the highlights of my week was a morning spent at the Cambridge Conservation Consortium, which is based at Corpus. The conservators, Elizabeth, Edward, Jo (who’s in training) and Melvin (in absentia) spent some time showing their very high-tech conservation equipment. My favourite piece was the guillotine which is approximately the size of a small country. They chatted to me about some of the things they do, what they enjoy doing the most, they let me watch them repair things and showed me some finished conservation, and spoke to me about some of the decisions they have to make concerning how they choose to conserve an item. I learned, most of all, that the work of a conservator requires an amazing variety of skills and talents, and the conservators were all, without exception, staggeringly clever and proficient. I left completely in awe of them, and having been beaten over the head with a big dose of mediocrity. So, while at the Parker Library I learned: about the ‘vault’, high-security and high-tech, where the manuscripts are kept and protected; how damage to the early printed books is prevented through regular, thorough cleaning; how conservation projects are prioritised; exhibitions, and how to make them good; readers, and how to make them behave (thanks in particular to a kind and willing engineer who pretended to be a medievalist for the day for my sake); the good, the bad and the ugly of enquiries–and how the digitisation project has affected them; … and loads of stuff more. There are practices that they’ve got at the Parker–such as an image database of the ex libris bookplates in their collection–which are so self-evidently good and useful I really hope we might be able to implement them here. PS The Parker Library also have a blog which is highly recommended! !